The concept of the open kitchen is all the rage in Paris right now, you can have it star-spangled chez Robuchon and Ze Kitchen Gallery, very sophisticated at Spring and Yam’tcha – but only at Guilo Guilo do you come so close that you could tap the chef on his shoulder at any given moment: there he is, Eichi Edakuni from Kyoto, surrounded by a handful of aides, he is the lord of this very small cooking island spilling out delicacies onto the surrounding bar. It’s a dance, a performance, a show, it’s hot, it’s cool, and it is all of these at the same time. 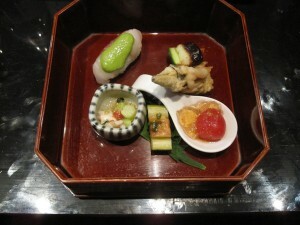 When you learn that this restaurant up in a very scenic street on Montmartre was named "best new wave Japanese" (by Le Fooding guide), you might get an idea of what to expect. 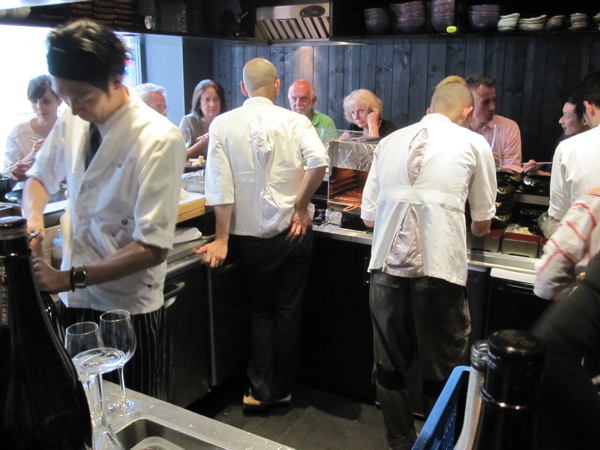 Yet I’m pretty sure that this chef will still surprise you with his fast changing 6 to 8 courses menus because witty is the best word to describe him, he’s a smart, funny cook who really wants to amuse you – and he’s very good at it. We were amused in many ways when we ate there not long ago. Amused, first of all, overall and in general because the food and produce are very good at Guilo Guilo and the setting is dramatic. Amused, secondly, by the precisely crafted plates and dishes, the long row of excellent little bites and spoons, all well seasoned, well done. Amused, thirdly, by the firework of culinary ideas and comic effects. Chef Edakuni is what I would call an intuitive intellectual, he plays with tradition, he uses cartoons clichés, he mocks the old school but his dishes are still tasty and comforting. You know, he serves pieces of calamari, for instance, looking just like fish’n chips, or he tops a piece of classic sushi with a spoonful of (hefty green) pea sauce making you think of a wasabi nightmare, or he combines ginger icecream with olive oil and foie gras with sushi rice – I know, it might seem a bit childish but believe me: when you sit there and the plates come rolling in, you’re all smiles and you wish it would never end. Guilo Guilo serves a prix-fixe-and-surprise-menu and nothing else, it comes at 45 Euros (which is, all ingredients considered, a bit overpriced). 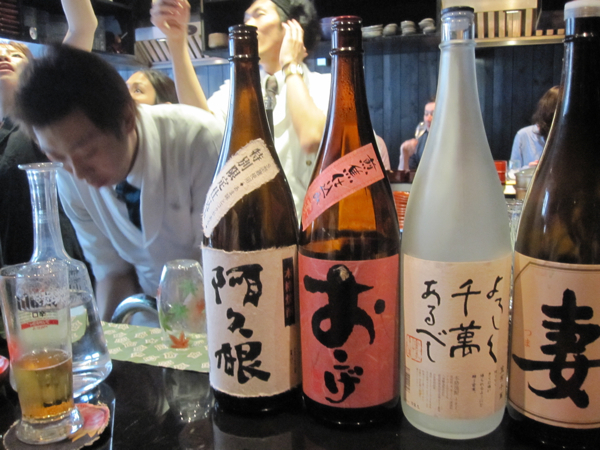 For the connaisseurs, there is a good Sake selection and a short, well-chosen winelist. The attentive and friendly staff speak French with enchanting accents, explaining the dishes as they arrive in front of you. Don’t think about going there by chance. There are two sittings at 19h00 and at 21h00 and you have to call one month or so in advance to make a reservation. 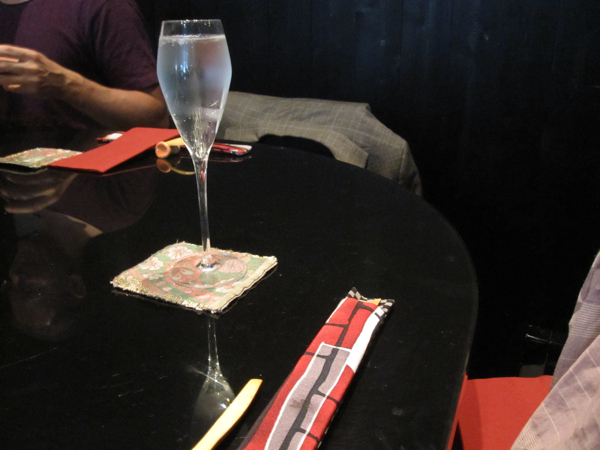 If you manage to get through, start your evening with a glass of sparkling Sake. And then, sit back and enjoy the show. Closed Monday night and every other Sunday.